All dogs must be on a leash and all cats must be in a carrier while at Tufts VETS. 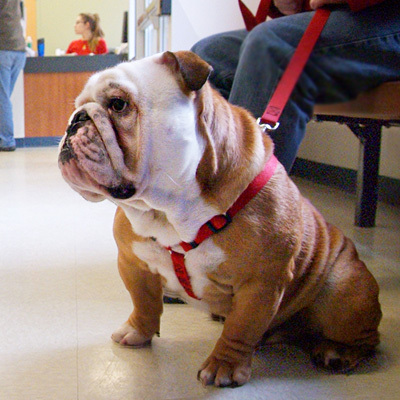 If your pet is coming in for surgery, please ask your veterinarian about withholding food prior to the procedure. Always have fresh water available to your pet. If your pet is hospitalized, you may provide us with your pet's normal diet to be fed in the hospital. We have a selection of veterinary diets from Hills, Eukanuba, Royal Canin and Purina Veterinary Diets to offer our hospitalized patients. We do not feed raw (BARF-type) diets in the hospital because handling of raw meats may allow the transmission of bacterial diseases to humans and other animals. If your pet may be hospitalized, please bring your pet's medication with you to your appointment. We ask that you take your pet's leash and collar or your cat's carrier home with you when your pet is hospitalized. We have a large selection of pet beds, pillows and blankets to keep your pet comfortable while in the hospital. However, if you would like, you may leave a small toy, blanket or other comfort object with your pet. We encourage you to not leave any large beds or blankets with your pet.